Commended in the FAW Awards for community writing. “Free at last! Free at last! Thank God Almighty we are free at last!” The words of Martin Luther King resonate down the years, expressing the relief and joy that hard won freedom brings. Loss of freedom can take many forms. It can be physical, emotional, intellectual or spiritual. This is reflected in the variety of the 60 poems, representing 41 poets. Some of them were winners in the 2003 Poetica Christi Press Poetry Competition; the remainder were selected by the editors from The Wordsmiths’ Poetry Group and other poets. 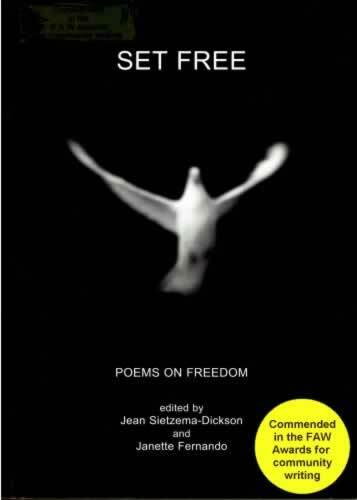 “Set Free – Poems on Freedom contains much evidence of that very freedom in its poems. Its many poets exhibit between them a freshness of vision and a brio in expression which hearten as surely as they illuminate. The poems bear witness that poetry is both a natural and an achieved art – as is life itself. All their fashioning is at the service of the liberated heart.” Peter Steele. *This poem was the winner of the Poetica Christi Press 2003 Poetry Competition.